Whenever a TV shows wants us to see the full horror of Victorian poverty, they shoot a sequence at the back of Somerset House, which they dress to look filthy and dangerous. We tend to think of the London poor in terms of Henry Mayhew, whose columns brought us ‘London Labour and the London Poor’, a collection of literary portraits of street people and their lives, totalling around two million words (the version you can buy today is massively truncated). We think of the rookeries behind Seven Dials and the Rotherhithe Tunnel, the pay-per-visit foot tunnel under the river that fell from public popularity and became the haunt of footpads and whores. But the one we know little about was much more famous and troublesome at the time because of its proximity to the royal and wealthy. During the first half of the 19th century, the Aldwych Arches were a high-ceiling cavern of tunnels, stables and vaults that ran underneath the Aldwych and came to be known as the Dark Arches. Before the Thames was narrowed to make a deeper channel there was a marshy foreshore rising to the road beyond, and the Arches raised the Adelphi Terrace to the height of the Strand, creating a multi-level platform below the Strand to the water’s edge. The structure was gigantic, and was frequently flooded with raw sewage, which brought rats scampering up into the elegant houses above. This is where the very poorest prostitutes worked, picking up their drunk clients above and leading them below. Hundreds of poverty-stricken people stayed here, often thieving from each other. More bizarrely, pleasure steamers used to stop there on Sundays, letting people off so that they could commit ‘all manner of indecencies’. In the latter part of the century the labyrinthine gloom was lifted with better lighting, but nothing stopped the gatherings. What finally got rid of this den of iniquity was the construction around 1870 of the sweeping Victoria Embankment, which removed the tumbledown chaos of the wharves and many of the steamboat landings, replacing them with a single clean road. 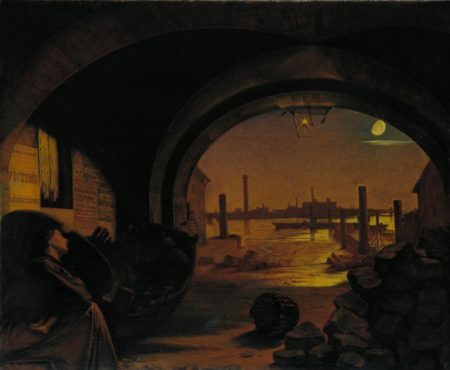 Augustus Leopold Egg painted a corner of the scene, although it doesn’t capture the vastness of the structure, which can be seen in etchings from the time. Gradually the last pockets of degradation were cleared from central London, and the idea that poverty was somehow picturesque began to fade. We have images of the past. During the industrial revolution, that of the city is one of urban squalor, while the countryside is a rural idyll. If the images reflect reality at all, why did Mr or Mrs Rustic participate in a mass migration from country cottage to a hole in the ground full of sewage? There are usually two reasons cited why there was a mass migration from the country to the city. The loss of common land due to it being ‘enclosed’ under The Enclosures Act and the Industrial Revolution. Agricultural workers would have grown their own food, keep a cow for milk and a couple pigs for meat, chickens for eggs. Wages earned would have gone to pay rent and raise a family, but without land, food has to be bought in, life gets uncomfortable. Without work, through illness, injury or seasonal demand it becomes precarious. Land also had an anchoring effect, once you no longer feel tied to a place there is less reason not to ‘up-sticks’ and move. Craft workers suffered when the products they made could be mass produced by machine, cloth, pottery, cutlery at much lower prices. Workers had to move to the factories to find work. Those are the textbook reasons, but once the process gets underway it creates its own wake and changes how food needs to be grown to feed cities. Cheaper imported goods become available, entire industries vanish. New goods appear, displacing old. Cotton replaces wool, coal replaces wood/charcoal, Oil lamps replace candles. Snowy – don’t you suspect that the rural idyll existed only in the minds of wealthy, land-owning aristos and the artists they paid to record it. Aah the good old days – at least you could rely on sewage that wasn’t full of cocaine and giving eels fits (according to recent news). Not sure whether its a good or bad idea to visit an eel and mash shop these days…. Snowy – gas lamps and gas mantles replaced oil lamps. I remember gas lights and heaters above the counters in Woolworths and the Co-op right into the 1960’s. Was life in the country one of bucolic bliss? Like most things it depends. Air was clean and fresh, provided you are not downwind of a midden. Water was clean and free from the well or pump, provided you safeguarded the source. Food was healthy, plentiful and cheap, provided you grew/raised it. Accommodation usually was provided by the employer, if you were employed. Work came in a regular pattern, periods of backbreakingly hard toil* followed by periods of light ‘husbandry’. Work was hard, heavy and unrelenting. Accommodation was in short supply and generally of poor quality. Food supplies were variable in quality and availability, the cost of transport makes them expensive and some are adulterated deliberately to wring out a bit more profit. Water quality was suspect, polluted by human and industrial waste. Air was polluted as a result of cramming a huge population and industry together in higher densities than is sustainable/sanitary. Mind you it could be a bit dull in the country, not much to excite the senses and you’d probably end up marrying your cousin, [or a goat]. There is really no one single answer to the question, the slow transition took over a 150 years, foreign wars, technological change, freak weather events, social and political reform all played a part in shaping what each generation experienced. I spent an afternoon this week in a lecture theatre that was designed to be gas-lit. I had to be very well behaved and NOT “being rude spending your time being distracted by trying to work out where all the original fittings would have been, while the poor bloke is trying to give his talk”. Dickens (No less) stated Jacobs Island was”the most extraordinary of the many hidden locations in London” Jacobs Island was in Souhwark on the South Bank just S of the Thames. It was basically a rookery built haphazardly around early industrial buildings which caused terrible pollution in the area. Jacobs Island was situated on one of the better drained “islands” in the South of the river marsh which in reality was not fully or properly drained until the 19C. The Morning Chronicle of 1849 called it “the Capital of Cholera” and “the Venice of Drains”. In Oliver Twist Jacobs Island was Where Bill Sykes drowned in the Neckinger river which ran nearby. A tributary to the Thames the Neckinger now a lost river of London-‘ being confined to a sewer and storm drain. Jacobs Island was a terrible place of dreadful poverty and deprivation. Gone and forgotten now. The old mills which were part of the later improved development of Jacobs Island were converted to luxury flats in the latter part of the 20C. In fact the only slight remnant of the original nature of this area lie in the Thames. The inhabitants of the River barges at Reeds Wharf near the Old Mills development are normally in somehow of conflict with their well heeled neighbours! Jan I lived in a block of flats in Jacob Street in the early 80’s, the ground floor flats became uninhabitable as they flooded badly, bubbling up through the floor. I suspect remnants of the ditches, marsh. Nineteenth century rural England wasn’t very pleasant. Not quite as bad as Irealnd, but after the abolition of the Corn Laws prices were low as a result of foreign competition. Read Amaryllis at the Fair or look at Kingsley’s accounts: https://www.poemhunter.com/poem/the-bad-squire/ for example. Good Lord deliver me.” isn’t exactly high praise. What Peter T said. Keep in mind the enormous innovations in urban living sparked by Victorian-era industrialization. The UK led the way in industrialization–first in, without thought except profit; consequently horrible social problems. But once recognized, applied minds started solving civic issues, Haywood, Brunel, etc. Something to think about during the 4th Industrial Revolution when the rural -urban divide continues. It’s hard to get high levels of life changing innovation out in the sticks. That’s really interesting Laura it could have been the Marsh making its presence felt or it could have been the Neckinger the lost river. I’ve already bored Mr F with this I was in town in January and I’ ve been doing a fair bit of research on the Neckinger. Reading, walking the river route etc. Many geologists believe the Neckinger may in fact be the remnants of an Oxbow lake. As from its rising point behind the Imperial War Museum it flows AWAY from the Thames and actually needed to be connected to the Thames at both ends to make it navigable – which it was after modification for a good deal of its length. The guys who did this work were from the Cluniac Priory of Bermondsey. They must have been like Navvies these monks cos they also improved the Effra over in Lambeth. The lost rivers of London do rise occasionallyb they are not as firmly held down in sewers and storm drains as we tend to think. I wonder when this new super sewer cones on line what effect that will have on the Lost Rivers of London.